Bafana Bafana assistant coach Thomas Madigage has been killed in a car crash in South Africa in the early hours of Friday morning. A South African Football Association (Safa) statement said the accident happened near Burgersfort in the Limpopo region of the country. "We are shocked and at a loss for words and as we speak, we are on our way to meet the family and find out what actually happened," said Safa president, Kirsten Nematandani. Madigage is thought to have collided with a stray donkey as he travelled to visit his sick mother on the R37 road between Polokwane and Burgersfort. 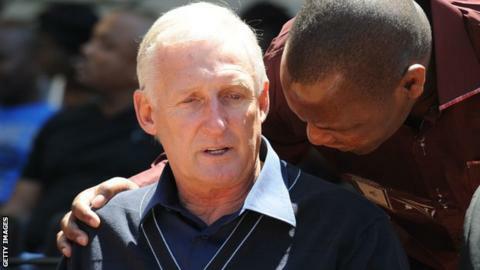 A memorial service was held at Safa headquarters on Friday, attended by a visibly distressed coach Gordon Igesund (pictured). The 40-year-old former national midfielder was appointed as an assistant by Bafana Bafana coach Igesund in July. Igesund said: "I have known Tommy for many years, he was not only my assistant, he was much more than that. He was a friend. "Since working together, he had become part of my family. You can't get a better human being than what Tommy was. He was humble, loyal, committed and sincere. "He was so happy to be a part of the Bafana Bafana set-up and he had so much to contribute. "He was so looking forward to the Nations Cup finals and it will be very difficult to participate without him. We will dedicate our Nations Cup campaign to him." In a glittering playing career, Madigage became the youngest player to feature in the South African top-flight after making his debut at the age of just 16 in March 1987. His performances for Cosmos eventually earned him a move to Swiss side FC Zurich in 1990. At a time when South African players rarely went to Europe, Madigage became a pioneer for the likes of Lucas Radebe and Mark Fish when they moved to England as the 1990s progressed. He scored on his debut for Zurich but also injured his knee and was ruled out for the rest of the season. Madigage was eventually forced to return to Cosmos in 1992 but never fully recovered from his nagging injury problems, although he did end up making four appearances for the embryonic Bafana Bafana team. He spent 10 years on the books of Pretoria City - which later became SuperSport United - before finally retiring in 2003 having scored 51 goals from 310 appearances. Madigage eventually became SuperSport's assistant to future Bafana Bafana coach Pitso Mosimane and stayed in the role when Gavin Hunt took over in 2007. They guided the team to three successive Premier Soccer League titles. It was this success that persuaded Igesund to offer him the role as Bafana assistant.